From Cape to Cairo – Rhodes` vision of the conquest of Africa. He got as far as Northen Rhodesia , modern day Zambia, and through his agent and companies influenced mining development as far as Katanga now in DRC. It is disturbing to see how many politicians, academics, journalists and now funders have ganged up against the student led Rhodes Must Fall (RMF) Campaign. The statue will now remain in place and Oriel College has called off its six month consultation on the issue after donors threatened to withdraw their support. A small concession may have been won as the statue may have a plaque explaining its context although it will remain to be seen as to what this will say. The debate played out in the media has been one-sided – in fact it can hardly be described as a debate with so many heavy hitters weighing in on the side of keeping Rhodes and the outcome being decided when `money talks`. 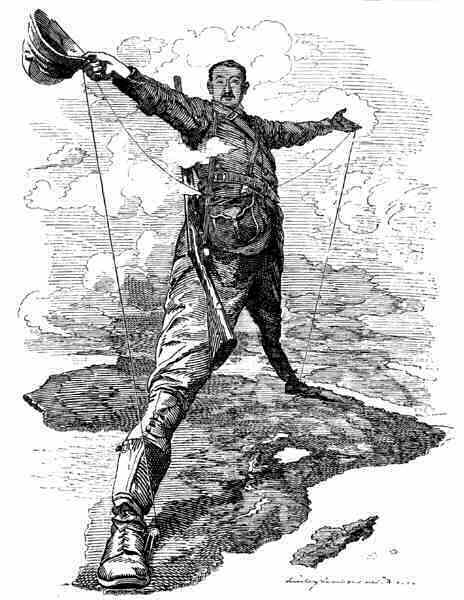 What has been missing in the public discussion throughout is any real sense of Cecil Rhodes` historical role and how this impacts on the present. Rhodes is simply presented as a flawed but pioneering figure – the `yes he was a white supremacist but…` argument and excused on the basis that there were others like him. Chris Patten, chancellor of Oxford publicly told the students that if they did not like Cecil Rhodes they should “think about being educated elsewhere”. Mary Beard, the feminist classicist weighed into the debate early on suggesting that students need to toughen up and develop a quality of “unbatterability”. One wonders how these statements translate into policies of diversity and inclusion at a university said to be attended by less than 30 black students in a single year. However, it is the RMF campaign that is being silenced and it is apparently Patten, Beard and Anthony who are uncomfortable with what the students have to say. They acknowledge that “our cities are built with the proceeds of activities, the slave trade and so on, which today would be regarded as completely unacceptable” but while they are willing to discuss this history, they do not want these discussions to translate into demands for action – an apology, reparations perhaps or the simple symbolic removal of a statue. The RMF students are not asking to censor history but to make audible long suppressed other voices and in the process making universities more challenging and inclusive spaces where the impact of British imperialism on the lives of others can be examined and responded to. Behind the `bad boy but…` image of Rhodes is a story to tell of black lives ruined for over one hundred years and the ongoing neo-imperialism that continues to blight those regions touched by pioneering spirits such as his. Cecil Rhodes held black lives cheap. They were the inconvenient occupants of land he wanted and the cheap labour upon which he built a British mining empire. Ntokozo Kwabe from the RMF campaign said that the decision of the university to abandon the consultation simply “reminds us that black lives are cheap at Oxford”. A man of action, he set about realising his vision with utmost ruthlessness in Southern Africa; it was a conquest funded by mining for which his main source of finance came from another figure not often named in the RMF debate, Nathaniel Rothschild, his friendly banking ally. His achievements were not individual, the exploits of an intrepid Rider Haggard type seeking treasure, opening up an `unknown` continent and largely confined to a slightly embarrassing past. Rather, his achievement in southern Africa, was to consolidate and extend white settler states and establish a systematic process of exploitation of conquered black Africans in which they were deliberately kept in a state of `underdevelopment` and inequality while the wealth extracted from their land and labour flowed into the pockets of financiers and major mining company shareholders in London. Rothschild`s Bank was one of the main recipients of this wealth. In 1871 at the age of 17 he joined his brother in South Africa where he entered the diamond trade in the Kimberley region. Here the discovery of a massive diamond site had prompted a `diamond rush`. 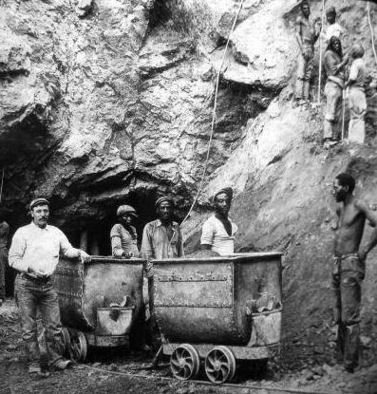 Over the next seventeen years, Rhodes bought up mines and claims around Kimberley, and contracted exclusive sales rights to output of other mines, and he combined these into De Beers Consolidated Mines Limited. Through growing political influence he constructed a global supply monopoly, and through continually raising capital through a relationship with the Rothschild bank and through equity-raising on several European stock markets , and through managing demand around such centres, he created a global supply and price-fixing system for distribution of 90% of the world’s diamonds. De Beers maintained control over 90% of the diamond industry until the 1980s. The land in Northern Cape where the diamonds were found were subject to conflicting claims including many made by black people. Many of the original occupants of these lands had already been driven out by Dutch colonists looking for farmland. British seizure of the diamond fields from the competing Griqua people and Boers in 1871 (the Keate Award) benefitted Rhodes who continued to contest land control and hegemony with the Dutch-Afrikaans while as a diamond monopolist he bought output from mines in the same Afrikaner contested areas. Later, as we shall see, as a politician, he significantly restricted black Africans` access to land so that they could not independently own and develop mining claims or farms. Rhodes also set his sights on gold. Although his initial ventures into gold mining were not as successful as his diamond mining ventures, ultimately, the profits yielded to him by the Rhodes Consolidated Gold Fields in Witwatersrand were what enabled him to pay the mercenaries who assisted him in extending his power over the territory that was to become Rhodesia and eventually Zimbabwe. When gold was found at Witwatersrand in the 1880s, Rhodes did not immediately take part in the ensuing gold rush and missed out on the best claims. So he looked north to Matabeleland and Mashonaland. Lobengula, king of the Ndebele (also called Matabele) people had allowed mineral rights to a small number of individuals. He had also sent men to work in the diamond mines, but he consistently resisted any sort of British interference in his territories. However, Rhodes convinced a reluctant UK government that if he did not act quickly, they would lose the opportunity to control Matabeleland to the Dutch, the Germans, the French or the Portuguese in the scramble for Africa. He formed the British South Africa Company (BSAC) modelled on the East India Company; an armed commercial and political body intended for the exploitation of resources and extension of political power. Rhodes` business partner Rudd convinced Lobengula to give exclusive mining rights to the BSAC in return for protection from the Boers and neighbouring enemy African tribes. 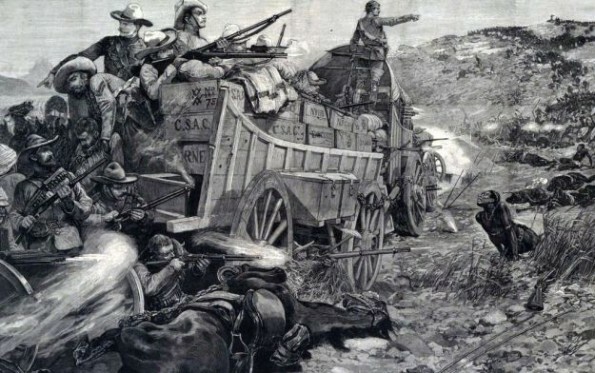 Fearful of a Boer attack in which Ndebele warriors angry at white incursions into and exploitation of their land would be massacred, Lobengula opted for the apparently more friendly terms offered by the British. But Rhodes used this treaty to persuade the British Government to give the BSAC a Royal Charter allowing the company to act on behalf of British interests with full imperial powers including a police force, to open up mining concessions, to acquire and settle land and build infrastructure. Determined to claim Matabeleland and Mashonaland for white settlers, he paid mercenaries to support enemies of Lobengula in an attack on the Ndebele king. In order to avoid war, Lobengula gave permission for unlimited numbers of BSAC miners to enter Mashonaland. But Rhodes really wanted complete control over the territory and an end to Lobengula`s power and influence. He sent a `pioneer` column of nearly 200 miners and over 400 armed troopers to `protect` them into Mashonaland and hoped to provoke Lobengula into either attacking or capitulating. In September 1890, the BSAC invaded and occupied Mashonaland without a fight. Lobengula in a desperate attempt to save his people from massacre conceded Mashonaland. But, the goldfields of Mashonaland had long ago been mined out and so the `pioneers` and troopers were granted farmland instead, against the terms of the Rudd concession. Without gold in the goldfields the BSAC was facing financial ruin and for Rhodes the conquest was not complete. He set his sights on Matabeleland. Accusing the Ndebele of terrorising the neighbouring Shona people, Rhodes gained permission from the British government to engage in `defensive` action. His mercenaries, armed to the teeth with the latest military hardware including four Maxim guns which could fire 500 rounds a minute occupied the Ndebele land. In the battle of Shangani River in 1893 1,500 Matabele warriors were slaughtered while only four British troopers died. Lobengula burnt down his capital and was forced to flee. Mashonaland and Matabeleland soon came to be known as Southern Rhodesia. Maxim guns had only been developed about 10 years previously and one of the main financiers in the Maxim company and its expansion by combining it with Nordenfelt was Nathaniel Rothschild. In 1890, Rhodes had become the Prime Minister of Cape Colony. It is a little known fact at this time that the Cape Colony had had a non-racial franchise for forty years. Afrikaners are often blamed for starting the apartheid system in South Africa but it was in fact the Englishman Cecil Rhodes who put in place the necessary mechanisms to make this possible. Mining companies were keen to ensure a steady supply of labour. They were also keen to limit the Black population`s access to wealth and political power. Rhodes was able to deliver this to them by means of two laws designed to pressure Africans to enter the labour market cheaply and in great numbers. The mines were not highly mechanised and the process of bringing the ore out was known as ingolovane – the same name as the trucks pushed out from underground in endless succession by the workers. This part of the legislation introduced by Rhodes was to become the foundation of the 1913 Natives Land Act, which restricted Black Africans to less than 10% of the land in Southern Africa and was a precursor to Apartheid and the creation of Bantustans. Fourthly, the laws raised the property requirements for the franchise and required that each voter should be able to write their name, address and occupation. This effectively disenfranchised the majority of black voters. Marxist debate in the 1970s sought to understand the phenomenon of what is called the `partial proletarianisation` of the black labour force – whereby black workers worked in the mining industry but also retained connection with rural communities still operating outside of a capitalist economy (Perrings, C. 1979). Often this land was some considerable distance away from the mining areas so the mineworkers were mostly migrant labour forced to live together in compounds. Their families, particularly the women, worked small plots of land back home and this was where the mineworkers returned to when they were sick, injured or laid off. This `partial proletarianisation` was not a matter of choice on the part of the black workers, nor could it be said to have simply evolved in this way. It was deliberately constructed through legislation such as the laws introduced by Rhodes to ensure a continual access to a cheap and controllable work force. Far from engaging in traditional occupations on traditional lands, black Africans were forced into and contained within small areas of land far from adequate with regard to meeting their needs. They were restricted from setting up businesses. Taxation put further pressure on them so that one or more family members would have to seek work elsewhere – often very far away. Migrancy made it very difficult for the mineworkers to organise collectively to demand higher wages and better work conditions and so wages were kept low. The `social reproduction of labour power`, the work mainly done by the women such as the raising of children (the future generation of workers), caring for the sick and elderly, support for laid off miners was mainly confined to the rural homelands and cost the mining companies nothing. So effectively, the part of the workers` lives that was outside of the capitalist economy and the work of the women subsidised the mining company profits in addition to the high surpluses generated from the low costs of labour. These rural homelands were deliberately left `underdeveloped` with poor access to healthcare, education or for example to financial support to develop businesses to generate income and create jobs within the communities. Escaping the pattern of migrant work would be impossible for generations to come. It was fully Rhodes` intention that the black population should be subservient to the mining industry and the needs of the white population. Under this system of `partial proletarianisation` black workers were not free to live and work and create permanent communities in the mining areas and engage in collective bargaining like the white workers were. Compound life made it easier to identify organisers or so-called `troublemakers` and isolated workers from other mineworkers living elsewhere. They could not set up businesses as part of the infrastructure that grows around a mine such as cafes or shops. But they were also not kept in a state of slavery where the slave owner must support the enslaved workers and keep them alive during periods of economic depression – they were simply laid off. This system of labour exploitation is described by South African sociologist John Rex describes as “the theoretically most perfect system of labour exploitation yet devised”(Phimister, I.R. and van Onselen, C. 1978). Race, class and gender intersect. In the hundred and twenty years since Rhodes` legislation, thousands of African men, women and children have subsidised the wealth of the shareholders of de Beers, AngloAmerican, Goldfields (now Sibanye) and numerous other mining companies through their labour both low-waged and unwaged. Southern African mines continue to be dependent on migrant black labour. The mineworkers` families in the rural communities they have left behind, in many cases situated in countries much poorer than South Africa (Mozambique, Botswana, Swaziland and Lesotho) are still forced to bear the cost of their care when they are laid off sick or injured. According to public health research at Witwatersrand University, almost one in three workers suffered from silicosis and tuberculosis was widespread. The limited health care that the mining companies provide does not extend to the villages the mineworkers came from and inevitably, when they become too sick to work they are `retired`. Lung disease caused by mining may also develop after retirement. Dying men are forced to go to court to claim the compensation that is their due and may never see it awarded. In several separate cases, thousands of miners have launched lawsuits against major gold mining companies for negligence that resulted in them contracting lung disease. The lawyer representing 3000 mineworkers in one case, Charles Abrahams, estimates that between 350,000 and 500,000 gold miners have contracted lung disease in South Africa in recent decades. 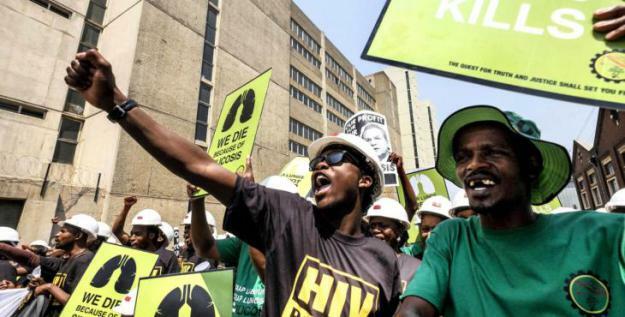 Members of the Treatment Action Campaign, Section27 and Sonke Gender Justice march in Johannesburg in a protest highlighting the issue of miners suffering from silicosis and TB. Ntozoko Qwabe, spokesperson for the RMF campaign, as a Rhodes scholar has on several occasions been accused of hypocrisy for accepting the scholarship. He responds that far from being hypocritical, he is reclaiming a small part of that which was plundered from Africans. Andrews accuses the RMF campaign of using accusatory rhetoric and suggests that Qwabe is emotive and using `overblown` language, describing him as saying with “ gesticulating anger… that the statue, the curriculum and the shortage of black students and academics at Oxford forms part of a “racist” outlook that amounts to “structural violence”.” But if you examine the system of exploitation of black workers and their families developed by Rhodes and outlined above, it would seem that to call this racist and structurally violent is simply a statement of fact. It would be a bit unusual NOT to feel emotional about it. Rhodes – Individual or System? Patten, Beard, Anthony and others have argued that Rhodes was not alone in acting as he did and indeed this is true. Imperial history is littered with individuals who sought to extend the reach of the empire and exploit resources in the cheapest possible way. The mid to late nineteenth century was a period when private, armed entities with Royal Charters such as the BSAC set up by Rhodes and supported by Rothschild led the way in extending British imperial power, particularly in Africa. But this does not mean that everyone agreed with them or thought in this way. Rhodes` ventures into Mashonaland and Matabeleland ran counter to British government policy and he was opposed albeit too weakly to be effective in halting further expansion north of South Africa. Rhodes` legislation directed against black Africans was also opposed by a number of members of the Cape parliament but again not effectively enough. As mentioned above, the Ndebele and Shona people put up a valiant fight which was met with extreme brutality. Right from the beginning, mineworkers found ways to resist and subvert exploitation. They communicated through their own networks about and avoided mines with the worst conditions and engaged in a variety of informal strategies such as `loafing` and `deserting after payday` (Phimister, I.R and van Onselen, C. 1978). The feminist novelist Olive Schreiner was one of Rhodes` most articulate and radical contemporary critics. It is odd that feminist academic Mary Beard does not seem to have read her. Schreiner`s novel, Trooper Peter Halket is a powerful indictment of British imperialism which names Cecil Rhodes as responsible for the massacres and land grabs in Mashonaland and Matabeleland and the cruel suppression of the Shona and Ndebele uprisings in the 1890s. It was published in London in 1897 in the same week that Rhodes was also in London facing questions from a Parliamentary Committee of Enquiry about his role in the Jameson Raid (an attempt to take-over Boer lands in neighbouring Transvaal) and the activities of the BSAC. He did have to resign as Chair of the Board of the BSAC although he remained an influential shareholder. Schreiner insisted that the frontispiece of the book include the photo of the notorious Hanging Tree opposite the title and Schreiner`s name. This tree, near Bulaweyo, was where the BSAC hanged so-called rebels; events also described in the story. The inclusion of the photograph powerfully reinforces the fact that the story is based on true events and real people. Unlike the African fantasy adventures of Rider Haggard, Schreiner`s book Trooper Peter Halket is a bleak expose of the brutality of imperialism, of kraals laid waste, of African men and women maimed, raped and murdered and in which the `white adventurers` are brutal and without, it seems, any moral compass. At one point in the book the anti-hero Peter Halket thinks about things he has done in Africa that he could never justify to let alone tell his impoverished mother back in England about. Redemption is only available to those who risk everything to reach out the hand of solidarity to Black Africans. Exposing Rhodes` culpability for the brutal acts in the book, the conflation of wealth with greatness in the mind of Peter Halket and the other morally compromised characters who do Rhodes` work “emphasizes the power of Rhodes as a system that requires the knowing complicity of others.” Schreiner`s letters are consistent in this critique of Rhodes as a system. She describes him as a man who has chosen to “act on men through the lowest sides of their nature” and who himself has chosen “the lowest path”. Those who were not opposed to him have helped to create through Rhodes a system of ruthless imperial expansion that will leave have worrying consequences for the generations to come. In later writings, she continued to articulate her fears about the long-term damage that British imperial policy might have done stating “ with terrible historical clairvoyance that within fifty to one hundred years the bill for the wrongs done to the natives will be presented for payment, and the white man would then have to settle it.” (Sarvan C.P. University of Zambia). This article first appeared on Undermining the Profits website.